When the hindfoot strikes down in a typical DS gait, it lands just behind the forefoot on the same side (Figure 3B, no. 6)—which is why the unilateral bipod of support is so small (Figure 3B, no. 7). In a tree that hindlimb will be landing on the same support as the forefoot. The animal has already put weight on its forefoot on this support, and so it knows that the support is safe. If the next foot to descend—namely, the diagonally opposite forefoot (Figure 3B, no. 8)— lands on an insecure support that breaks or shifts, the animal can keep from falling by grasping the proved support with its hindfoot. Figure 7. Our data (Cartmill et al., 2002) for 130 walking gaits (hind duty factor >50) for 17 genera of primates (Microcebus, Mirza, Lemur, Eulemur, Varecia, Hapalemur, Daubentonia, Otolemur, Nycticebus, Loris, Perodicticus, Cebus, Ateles, Erythrocebus, Papio, Macaca, Pan), plotted on the Hildebrand diagram. The sloping dashed line represents the equation (diagonality = hindlimb duty factor) that a diagonal-couplets walk in DS (boxed gray area: 50 < diagonality < 75) must obey in order to minimize the duration of bipedal support phases in general and of unilateral bipedality in particular (Cartmill et al., 2002). In the gaits that fall above this line, total bipedality is minimal but some percentage of the cycle is spent standing on the unilateral bipod (Figure 3B, no. 7); in those that fall below the line, unilateral bipedality is zero but total bipedality is not minimized. Eighty percent of the primate data lie within an envelope (diagonal white band) of ± 5% deviation from this optimal line. in terminal branches and twigs, where the next footfall may prove treacherous. In such a situation, it is useful to establish a safe anchor on the last foothold before trusting any weight to the next one. 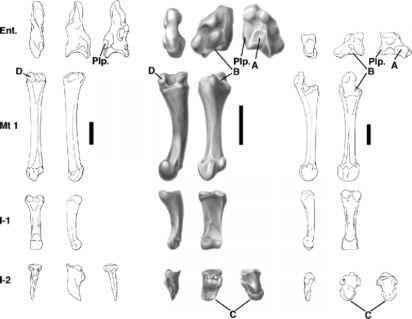 The DS footfall sequences of primates, in which the hindfoot in the diagonal-couplets pair strikes down before the contralateral forefoot in time and just behind the already-planted ipsilateral hindfoot in space (Figure 3B, nos. 6-8), work in combination with their anatomically specialized hindfeet to accomplish that aim. Figure 8. 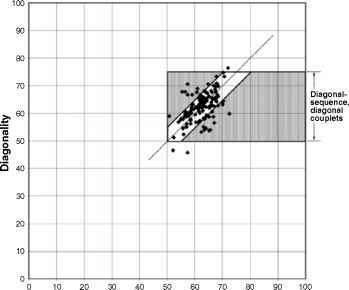 Diagonality plotted against the duty factor index (100 x hind/fore duty factor) for nonprimate gaits and for walking gaits of primates other than Callithrix (Cartmill et al., 2002). Nonprimate running trots (black triangles) and some of the fast trotlike LS walks deviate from the plane of the Hildebrand diagram (y = 100) because the stance phases are short in these fast gaits, and so differences of a few frames in the length of one stance phase produce large fluctuations in the index. By contrast, primate walks (open circles) deviate from the Hildebrand plane even at low speeds. If primate DS walks were simply walking trots with enhanced hindlimb duty-factors, their scatter would intersect the plane of the Hildebrand diagram (heavy horizontal line) where diagonality equals 50 (vertical dashed line). Instead, they lie mostly to the right of the scatter of nonprimate trots, even below the plane of the Hildebrand diagram. This distribution shows that the high diagonality of primate walks is not due solely to increase in hindlimb duty factors. Diagonal-sequence walks are not the only walking gaits in which a hind-foot is already on the support when the forefoot strikes down. All quadrupedal walking gaits meet that description, because there is always at least one hindfoot on the ground at every instant in a symmetrical walk cycle. But differences in diagonality affect the placement of the supporting hindfoot at the moment of forefoot touchdown. Figure 4 illustrates limb deployment at that point in the cycle in a primate DS walk and a typical nonprimate LS walk. In the DS walk of the primate, the supporting hindfoot is protracted at the moment of forefoot touchdown, placing it beneath or slightly in front of the line of gravity. In the LS walk of the nonprimate, with a diagonality around 25, the supporting hindfoot is stationed far posterior to the line of gravity when the next forefoot comes down. Protraction of the hindfoot when the forefoot comes down is advantageous for primates and other tree-dwelling animals with grasping hindfeet. If the forefoot of such an animal comes down on an insecure support, the animal is still roughly balanced on its grasping hindfoot, and can pull back or right itself more easily. A primate that walked like a horse could not do this. A tendency to pitch backward at the moment of forefoot touchdown (Figure 3B, no. 8) can be seen in this light as adaptively advantageous. This tendency fits into the generally hindlimb-based pattern of quadrupedal primate locomotion. Unlike most nonprimates, primates in general sustain substantially higher substrate reaction forces on the hindlimb than on the forelimb (Demes et al., 1994; Kimura et al., 1979; Reynolds, 1985; Schmitt and Lemelin, 2002; Lemelin and Schmitt, this volume). This force distribution pattern, in combination with the tendency to neutral or backward pitch at the moment of forelimb touchdown, allows primates to test a support more gently with the forelimb before loading it more vigorously with the hindlimb. In principle, a primate could balance equally well on a protracted hindlimb at the moment of forefoot touchdown in a lateral-sequence walk if it inverted the phase relationships between its fore and hind limbs. This would lower its diagonality by 50 (that is, through a 180° phase shift), yielding a lateralcouplets, lateral-sequence walk (Figure 5). The supporting hindlimb would be equally protracted in both cases. Such a shift is in fact seen occasionally in some primates—for example, among macaques (Figure 6), where a lateral-sequence walk in lateral-couplets appears as a transitory variant during ontogeny (Hildebrand, 1967; Nakano, 1996). The appearance of this shift corroborates the thesis that primate walking gaits are adaptive because they optimize balance on the protracted hindfoot at the moment of forefoot touchdown. However, a lateral-couplets walk, in which the two limbs on the same side tend to move as a pair, is in general not desirable for a tree-dwelling animal, because the animal winds up spending most of the cycle standing on two feet on the same side. This unilateral sort of bipedality tends to produce unwanted rolling moments. Camels and some other long-legged mammals prefer lateral-couplets walking and running gaits—perhaps, as Hildebrand (1968) argued, in order to avoid stepping on their forefeet with their hind-feet in running and fast walking, when stride length increases. But such gaits are avoided by most arboreal mammals. For example, Procyon and Nasua use lateral-couplets gaits; but their monkey-like arboreal relative Potos uses strictly diagonal couplets (McClearn, 1992). We infer that the optimal way for a walking primate to balance itself on a securely planted hindlimb when the forefoot comes down is to use diagonal-couplets gaits in diagonal sequence (Figure 5A). 1 Our model suggests that primates should maximize hindlimb protraction at the moment of contralateral forefoot touchdown. We might therefore expect primates to exhibit greater maximum overall protraction of the hindlimb (i.e., at the moment of hindfoot touchdown) than typical nonprimates do. This prediction is concordant with the findings of Larson et al. (2001), who report that angular protraction of the hindlimb (the angle between the vertical and a line drawn from hip to ankle at the moment of hind footfall) is greater in primates than in other mammals, but is less than seen in marsupials. However, the relevant variable in terms of our theory is not angular protraction, but linear protraction—that is, the position of the hindfoot at touchdown relative to the length of the body axis. Since primates have longer limbs and greater stride lengths relative to trunk length than most nonprimate mammals (Alexander and Maloiy, 1984; Alexander et al., 1979; Larson et al., 1999, 2001; Reynolds, 1987), linear protraction of the hindfoot at touchdown should be correspondingly greater in primates than it is in other mammals with a like amount of angular protraction. This expectation remains to be tested. in fast walking, but it must exacerbate problems of balance for an animal moving more slowly and cautiously (with higher duty factors). Many primates accordingly show a positive correlation between diagonality and duty factor in their walking gaits: the higher the duty factor (and thus the lower the speed), the more the animal deviates from a walking trot (and thus exhibits increased diagonality). 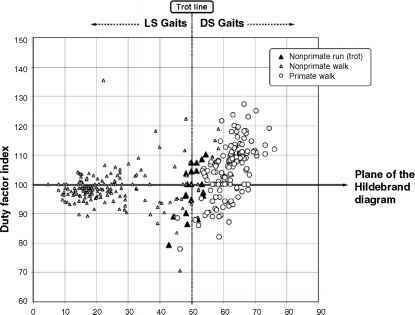 In our data, such a correlation is evident for walking gaits of primates other than Callithrix (Spearman's p = 0.454, p < 0.001). This pattern of covariation between duty factor and diagonality also means that primate walking gaits cluster around the theoretical line on the Hildebrand diagram where both total bipedality (the percentage of the walking cycle spent standing on only two feet) and unilateral bipedality are kept to a minimum (Figure 7; Cartmill et al., 2002).